A well-written cover letter is the perfect partner to your first job resume. However, since it is your first time to apply for jobs, you might be confused as to what you need to write on your application documents, especially with your cover letters. You have to figure out a way to structure it properly in a way that would complement what you have stated in your resume. You might not think about it much, but when it comes to cover letters, the tiniest details matter. Take for example the formatting. Job applicants tend to overlook this aspect of the resume, but you have to remember that resume formatting does matter. We will talk more about how to format your resume and other aspects that you should consider when it comes to writing your very first resume. Keep reading to know more about the guidelines and tips we have prepared. What Constitutes a Good Cover Letter? You are able to introduce yourself properly to the employer. You are able to answer accordingly to the job posting. You are able to pique the interest of the reader and you are able to convince them to look at your resume and contact you for further information. You are able to avoid making use of the word I and refer to yourself in another manner. One of the most basic things that should be considered when you are writing a cover letter is the format. This is true whether you are a first-time applicant or an applicant with extensive work experience. Always remember that a cover letter should not exceed one page. Any more than one page means that you have to rethink what you have included. A few paragraphs, about 3 to 5, would be enough. You have to make sure that it is informative without being too long and boring. Each paragraph of your entry-level cover letter should be straight to the point but still be giving out all the necessary information to prove that you are a good candidate for the available position. 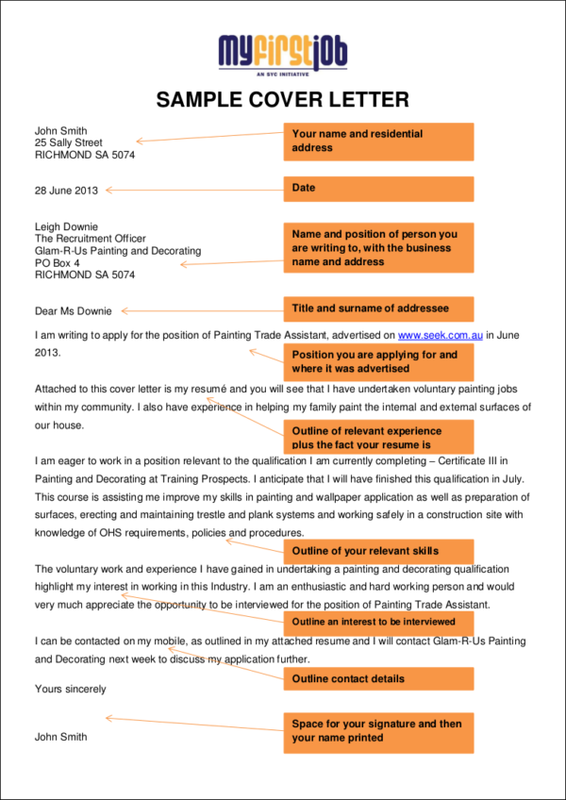 Make sure you write down all the correct information as this will be how the recruiter will be able to get in touch with you. One wrong number or letter on your contact information can make you lose an opportunity for a great career. 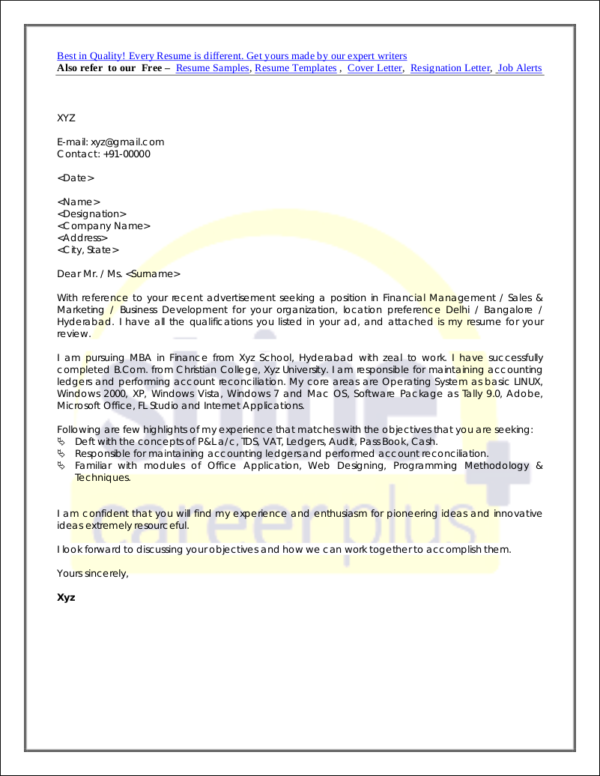 You may also opt to make use of a personal letterhead that reflects all of the information about you. Make sure that this is placed at the topmost part of the letter. In case you do not have your own letterhead just yet and want to make one for your personal stationary, you may want to check out our sample personal letterhead templates. The date and the recipient’s information. Two spaces after your contact information, the date will reflect and another two spaces after the date, you will write down the contact information of the company. Salutation. 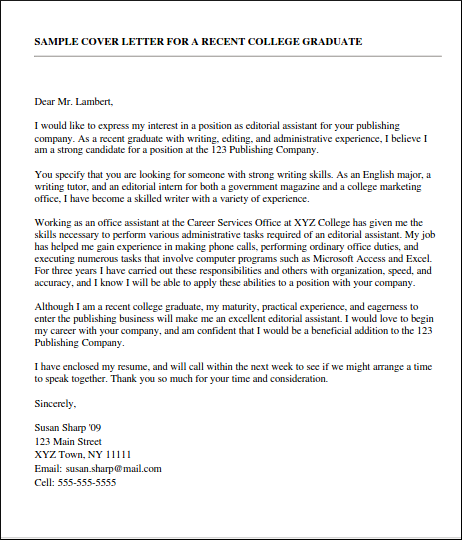 Just like any formal letter format, a cover letter will start with a salutation. The typical, “Dear [Name of Recipient],” will be used. Make sure that you address the person properly and use the appropriate titles such as Ms., Mr., Dr., Atty., etc. The Body of the letter. 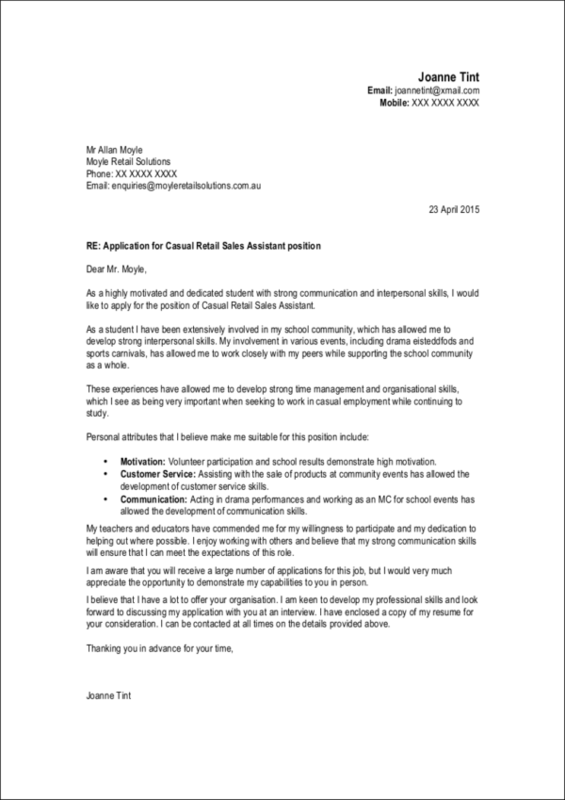 As stated, a cover letter should be limited to at most five paragraphs. So let us dissect each paragraph carefully. Paragraph #1. Start strong! Your first few words must directly capture the attention of the recruiter. Introduce yourself and make sure that you describe the position you are applying for. Paragraph #2. In this paragraph, take the opportunity to let the recruiter know how interested you are about the job opportunity. Highlight your skills and qualifications that you have and describe how these will benefit the company. Also, do not forget to research about the company and the vacant position they are offering. Paragraph #3 and #4. This is where you will talk about your certifications, achievements, and the training you have undergone in order to be considered as a qualified candidate. 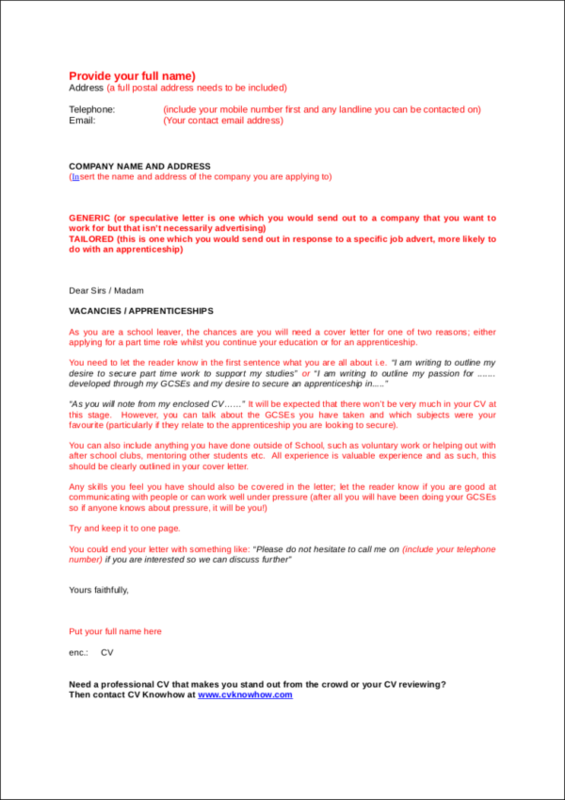 Any clarifications you might also have about the company and the job can be stated in this section of the letter. Final Paragraph. Wrap up your letter. This is the part where you express your gratitude and where you will invite them to get in touch with you in case they want to clarify anything about you and what you have stated in your application documents. Complimentary close and signature. End the letter in a respectful manner (i.e. Sincerely, Respectfully yours, Yours truly, etc.). Leave a few spaces then type your name and affix your signature above your name. Make sure you know who you are sending your letter to. A quick research about the company and who is in charge of the recruitment is recommended. The more specific, the better. You may also leave out the subject line and just make use of a subject line. if you are going to use a subject line instead of a salutation, write it down on the subject line section of the email. Since this is your first time applying for a job, the employer will clearly understand why you do not have any relevant experience just yet. Instead of focusing on the relevant experiences, there are other factors that you can include in your cover letter. 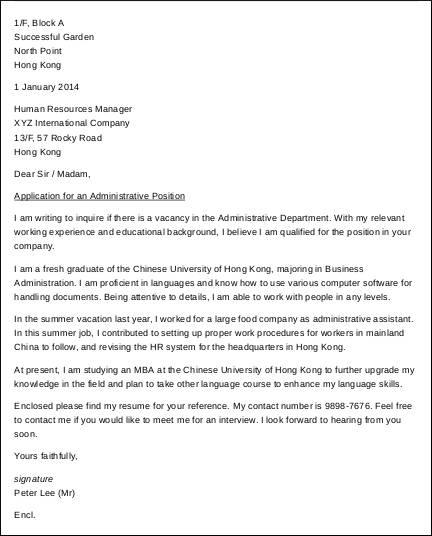 One page is enough for a cover letter. 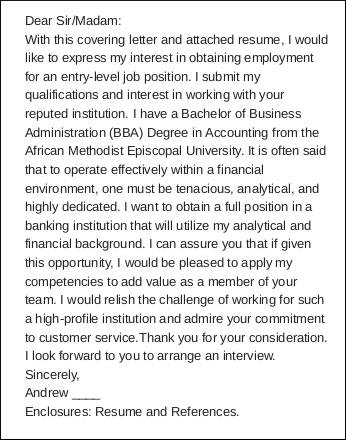 We cannot emphasize it enough but a one-page cover letter should contain all the necessary information you need to relay to the employer. The more concise, the better. Highlight your strengths and give specific examples to make your claims more solid. A targeted cover letter is the best one to go for. One of the reasons why you should customize your cover letter is the fact that it gives a better impression to the employer. Speak the company’s language. Watch out for a few keywords in the job posting and try to incorporate them into your cover letter. Address your letter to the correct contact person. Make sure you spell his/her name correctly. Proofread your letter. Your letter is less likely to be thrown away or shredded if there are no to minimal misspelled words and grammatical mistakes. Read through your letter multiple times. Have someone else read your letter too, just to make sure. 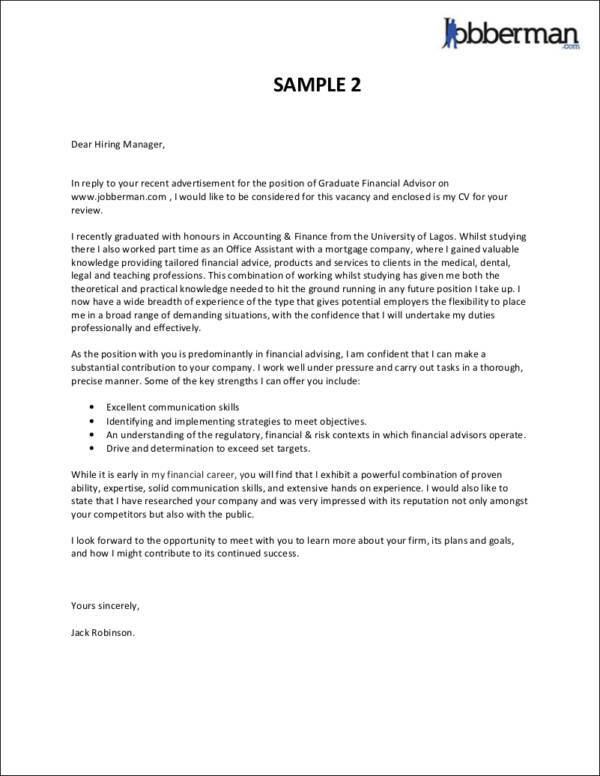 Since your cover letter is considered to be a formal letter, make sure that the language you will be using will also be formal and, at the same time, professional. Send a follow-up email or letter a few days after you send your job application. 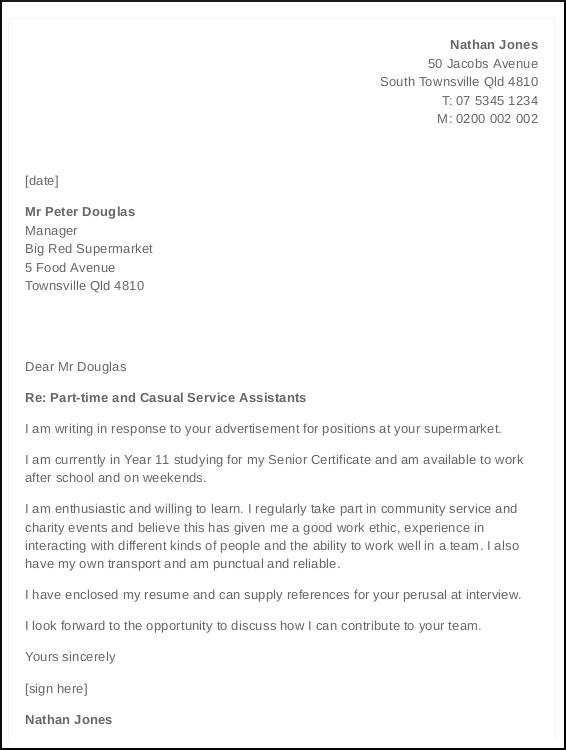 This shows dedication and it also shows that you are an eager and enthusiastic potential employee. Focus on your skills and personal characteristics that will be a good fit for what the company is currently looking for. Be honest and avoid making false claims just to make you look good. We are hoping that we have helped you with regards to making the task a whole lot easier for you. If you follow the guide, reminders, and tips we have presented, you are sure to end up with a well-written and job-ready cover letter. 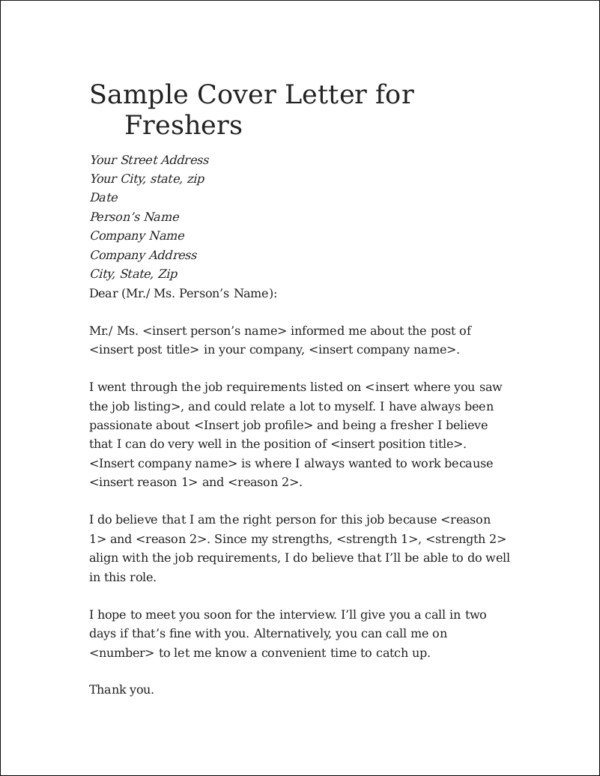 The examples we also have are going to help you get a better hold of how to present your first cover letter. One more thing about the samples we have? They are all downloadable at no cost! So, you can definitely enjoy going through each sample without any hassle and without burning your pockets.